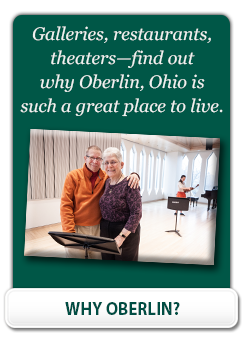 Why Donate to Kendal at Oberlin? Kendal communities were created to provide a better way to meet the needs of older adults. The Kendal idea fosters a culture of generosity, encouraging and developing full use of our time, talent and resources. Philanthropy has played a key role in the development of the Kendal organization. Those involved in the beginning of the first Kendal community set a tone of generosity—of spirit, of time, of talent, and of resources. Indeed, the Kendal story began with a gift, and this spirit of generosity continues to characterize life in Kendal at Oberlin through gifts that have made possible financial assistance for residents, capital improvements in the community, internships for students, and accumulation of charitable reserves. Read our Donor Stories here. An outright gift in the form of cash or securities permits an immediate federal income tax deduction. Gifts of long-term appreciated securities may offer additional benefits. For more information regarding a gift of securities please contact Barbara Thomas, Kendal at Oberlin’s Chief Executive Officer or Beverly Grove, Director for Philanthropy – The Kendal Corporation. These are bequests, gifts made over a period of time, and are structured to meet your specific financial objectives while also benefiting Kendal at Oberlin. Planned gifts can offer significant advantages of favorable income, as well as savings on capital gains and estate taxes. These options allow donors to transfer cash real estate or other assets – while in some cases retain an income from the assets for life. Please visit our Guide to Planned Giving here. For more information regarding “Giving Options” and the advantage of planning a special gift please contact Kendal at Oberlin’s CEO – Barbara Thomas, or Beverly Grove, Director for Philanthropy– The Kendal Corporation.